To support recovery, consume one serving of HydroCool immediately after exercise (on non-training days, consume one serving between meals) and as required to meet your daily protein target. For best results stack your HydroCool supplementation with a slow-digesting protein just before bedtime such as Ultimate Nutrition Prostar 100% Casein. Mix 40 grams (one heaping scoop) of HydroCool with 9 ounces (270 mL) of cold water or milk in a glass, shaker cup or blender. For a thicker shake, mix with 6 ounces (180 mL) of liquid and for a thinner shake, mix with 12 ounces (360 mL) of liquid. Hydrolyzed Whey Protein Isolate, Natural and Artificial Flavors, Chocolate Cookie Pieces (Bleached Wheat Flour, Sugar, Palm Oil, Natural and Artificial Flavors, Corn Syrup, Corn Flour, Baking Soda, Soy Lecithin, Salt), Sodium Chloride, Sucralose, Xanthan Gum, Acesulfame Potassium. HYDROLYZED 100% WHEY PROTEIN ISOLATE - NOTHING WORKS FASTER! 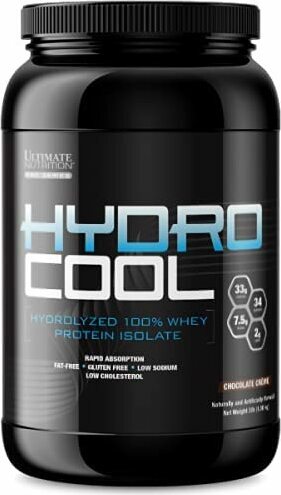 HydroCool is a fast-acting, ultrapure hydrolyzed whey protein isolate (HWPI) blend of multiple degrees of hydrolysis. HWPI has been processed with a mixture of enzymes similar to those found in the human digestive tract. These enzymes break down whey protein isolate into smaller fractions called peptides, which can be easily and quickly absorbed into the body to rebuild and strengthen muscle tissue. Every scoop of HydroCool provides 33 grams of premium-quality hydrolyzed whey protein isolate, over 15 grams of naturally-occurring essential amino acids (EAA) and over 7.5 grams of naturally-occurring branched chain amino acids (BCAA). Additionally, HydroCool has been carefully formulated to taste and mix better than the leading competition. Chocolate Creme This is a Buy 1 Get 1 FREE offer! Cookies 'n' Cream This is a Buy 1 Get 1 FREE offer! Vanilla Creme This is a Buy 1 Get 1 FREE offer!